If you are overweight, our sizing advice may not work. If you are overweight, you should not order footwear online unless you already know through experience with our boots that a particular size fits you well. Although feet are usually the last part of your body to pick up body fat, once fat wraps around parts of your feet, the length and width may be the same as before but your foot can become too large to fit into footwear designed for that length and width. Click here to skip down this page to our section which shows how to measure your feet. If you order the same size Wesco boot as your favorite old combat boots you could end up with Wesco boots that are too small. Older combat boots were larger than the marked size. (so were older Wesco boots) So your beat up old combat boots that are marked size 9 may actually be comfortably filled with size 10 feet. Those size 10 feet will be cramped in size 9 Wescos! Some of our boots are not only custom made for you, but made to your specific measurements. For instance, custom Dehner boots and Wesco boots over 20 Inches tall must be custom fitted and there is no extra charge for custom fitting of these boots. This is not a trivial question! Even if all shoes and boots were made to consistent sizes and you wore a size 9 shoe, you wouldn't always want a size 9 boot. Consider the Wesco engineer or logger boot. They are made slightly large so they will fit well with boot socks. So if you have a size 9 foot the size 9 Wesco boot will fit well when worn with boot socks. Finally, you should consider this: you can always adjust the fit of a boot which is too big, but if it is too small, there is no way to make it larger! Good boots will not stretch in length and will only stretch a bit in width. Your toes should never hit the end of the boots. The goal of boot designers is to have about ⅓ inch / 1 cm of space between your toes and the front of the boots. So it's better to get boots a bit too large than a bit too small. See the notes at the end of this page for techniques to adjust the fit. You can accurately determine your foot size and width using these simple instructions and the size and width tables below. The results will be the same as if your foot was measured with the familiar Brannock Device used in shoe stores. Of course, you can do this using a men's Brannock device at a shoe store. Click here for the official instructions for using that device. If the difference is over a half size, consider ordering custom fitted boots so that each foot can be accommodated with a boot of the correct size. Follow these steps for each foot. It's easier to have someone else do measurements. Sit in a chair with each foot firmly placed on a solid, flat surface. Put on your socks. You can take the measurements in inches or centimeters. Centimeters are easiest since there are no fractions involved. Our size tables work with both. The US remains the only industrialised country that has not adopted the metric system. Burma and Liberia are the only other countries which don't use the metric system. Place a brick so it's just touching your heel and the other brick so it's just touching your longest toe. Note that length measurement. Then place the bricks on either side of your forefoot and parallel to your feet. Note that width measurement. Repeat for the other foot. In other words, measure the length and width of each foot. Take the length and width measurements for each foot again while standing. Use the larger of the seated/standing measurements to find your size. Generally, the measurements will be nearly the same. If you have flat feet, fallen arches or are older, the standing measurement may be larger in length or width or both. It's typical that the length and width measurements for each foot will be slightly different. Use the measurement of your longest foot and the widest foot as your size and width. If the difference is more than one size or width, you should consider having your boots made with each foot in a different size. We can do that and it doesn't cost extra when you're having boots custom made. It never hurts to repeat the measurements a second time to be sure of the results. Remember the wisdom of the old carpenter's motto: "Measure twice, cut once"
Enter the Boot Size Chart just below with your length measurement and find the US Men's size on that same row. For example, your length measurement was 10 inches / 25.4 cm / 254 mm - find those measurements in the blue "Length" column and look to the right on that same row to see that the US men's size is 8. If your measurement falls between two rows in that chart, choose the higher size. So, if your length measurement was 26.0 cm you would choose US men's size 9. Enter the Boot Width Chart with the USA Men's size you just found and find the closest match to your corrected width measurement on that row. The length size is shown in red in the leftmost columnn. If your width measurement is between two columns, take the larger of the two widths. The top of each column shows the USA width measurement. For instance your US men's foot size is 10 and your feet are 3.9 inches wide. You go down the size column to "10" then, on that same row you see that 3.9 inches is between the column for "C" and "D" widths... your width is "D". 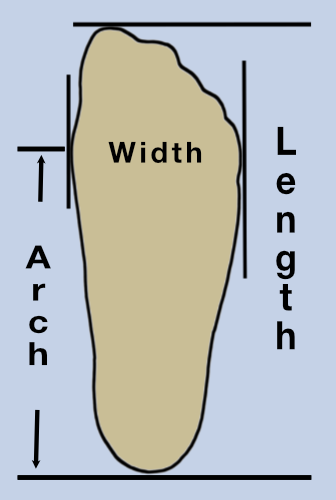 There is a Boot Width chart for measurements in inches and another for millimeters. if you measured in centimeters, multiply by 10 to get millimeters. Gap - inches ⅓" ⅓" ⅓" 0.26" 0.39"
Gap - inches ⅙" ⅙" ⅙" 0.13" 0.2"
European sizes are usually expressed as whole numbers such as 43 or half sizes as 43.5. In this chart they have been interpolated to show their closest match to USA men's sizes. Go to the row for your length size then find the width measurment of your foot in inches or millimeters on that row. The column head gives the width letter. Wesco boots come standard with a cushioned insole insert. If the boots are too tight, this insert can be removed or replaced with a thinner insert. Thinner socks can be worn if the boots are too tight.